The best Advanced Placement (A.P) Classes in Bangalore! What is Advanced Placement Exam? Advanced Placement(AP) is a program in the United States and Canada, created by the College Board, which offers college-level curricula and examinations to high school students. The Advanced Placement Exams test students’ ability to perform at a college level. By making the decision to take an AP course, you’re letting colleges and universities know that you have what it takes to succeed in an undergraduate environment. AP courses signal to admissions officers that you’ve undertaken the most rigorous classes your high school has to offer. Why take the Advanced Placement Tests? 31% of colleges and universities, especially the more selective colleges consider a student’s Advanced Placement experience when making decisions about which students will receive scholarships. 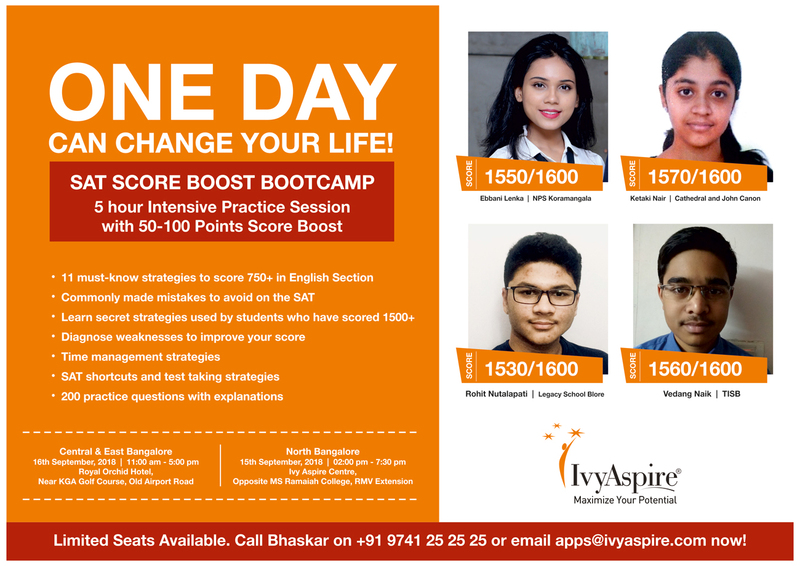 How Ivy Aspire helps student excel? Ivy Aspire offers customized, one-on-one coaching for the AP classes with experts in the field. Don’t waste time in group classes – work with our pros and get your AP curriculum mastered quickly and efficiently. We guarantee you a score boost! Contact testprep@ivyaspire.com or call +91 888 000 11 77 now to schedule an appointment! The 2015 AP Exams will be held from May 4-15, 2015. Registrations will begin on February 16, 2015 and continue until March 27, 2015. To see when your particular subject exam will be conducted please visit the AP Central College Board Website for updated information.